AlunaGeorge, Carl Craig, DJ Sneak, Greg Wilson, Boy & Bear and many more have been announced on the debut Lost Paradise lineup, a three-day camping festival taking place over New Year's Eve in the picturesque surrounds of NSW's Glenworth Valley. Taking its cue from UK festivals such as Wilderness, Secret Garden Festival and Bestival, Lost Paradise is a five thousand capacity event bringing together live acts and DJs across three stages combined with culinary delights, crowd-funded art installations, Shambala spa treatments for the yogies, an open air cinema, paradise kids and action camps, and luxury glamping options. Heck you can even arrive there in a chopper, if that's your style. And the best part? It's only a 90 minute drive from Sydney's CBD. 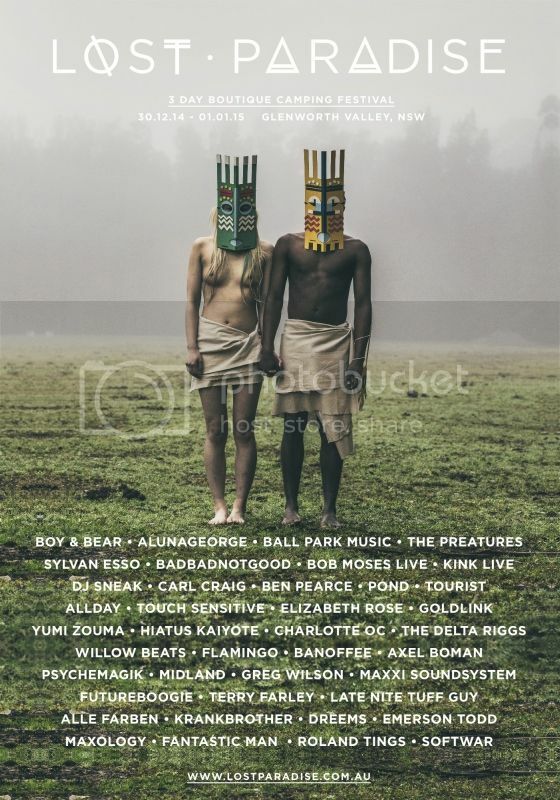 The lineup boasts a cross section of international and local acts across house, techno, disco, electronica, pop, indie and rock, and includes the debut Australian performance of hotly tipped US duo Bob Moses. Still not convinced? The team behind this brand-spanking new festival is Finely Tuned, who are responsible for some of Australia's best parties including Agwa Yacht Club and Circoloco, as well as this year's first Lost Picnic event in Centennial Park. Check out the promo video and full lineup below. Early bird tickets are on sale now for $259+BF (buy below). For all the nitty gritty on the upcoming event including camping and how to get there, head to the Lost Paradise website. And join the facebook page! Here's our guide to the best events happening across the country this winter. Here are 22 of the best, off-the-path, boutique festivals to get stuck into.